Assemblyman Cameron Smyth (left) with Gov. 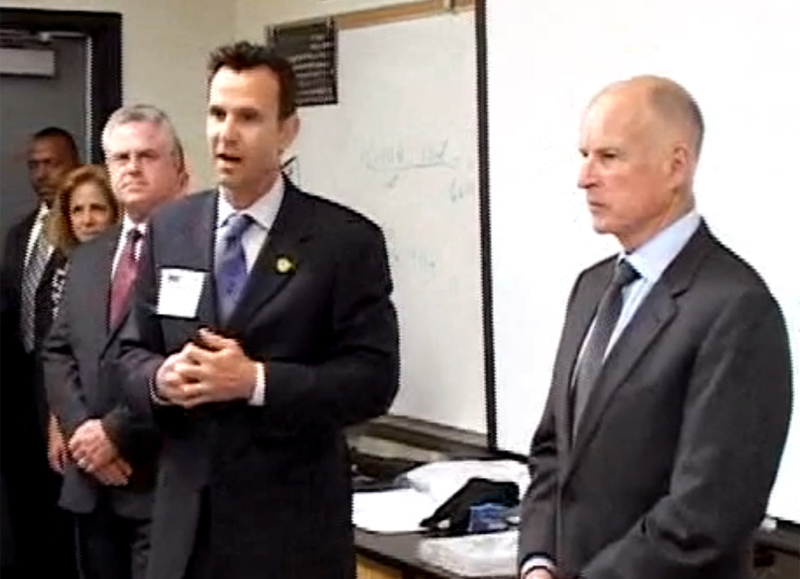 Jerry Brown at Hart High School in April 2011. The state Assembly passed a bill Thursday by Cameron Smyth that would allow public agency boards such as city councils to meet in secret with the governor. The bill creates a narrow exception to the Ralph M. Brown open meeting law (no relation to Gov. Jerry Brown) that generally requires public agency boards hold meetings that the public can attend. Under the Ralph M. Brown Act, public boards can meet behind closed doors only when discussing a narrow range of topics including confidential personnel matters, pending litigation, real property negotiations and immediate threats to public safety. When discussing credible threats to public buildings or utilities or public services, a governing board may include certain public officials in its private, closed door meetings – but only the attorney general, district attorney, the agency’s own lawyers, the sheriff or police chief or their deputies, or a security consultant or security operations manager. The governor of California isn’t on the list. Smyth’s bill would change that. It would allow public agency boards to meet in private with the governor when public safety is threatened. Smyth, R-Santa Clarita, carried the legislation at the request of the Los Angeles County Board of Supervisors, which violated the Ralph M. Brown Act last September when it met behind closed doors with Gov. Jerry Brown to discuss AB109, the prison realignment bill that shifted certain custody responsibilities from the state to counties. Last week the county announced it would pay $14,750.70 to cover the legal fees of Californians Aware, an advocacy group that sued the county for allegedly violating the Ralph M. Brown Act on Sept. 20, 21 and 26 when it met in private to discuss the effects of AB109. The Sept. 26 meeting included Gov. Brown. County Chief Executive William Fujioka said the county attorney initially thought the Ralph M. Brown Act allowed the supervisors to discuss AB109 in private, with or without the governor. “The Board of Supervisors earnestly believed that inadequate actions by the state, in both describing the AB 109 population and in providing funding to the county of Los Angeles for that population, constituted a potential threat to the county’s ability to continue to provide public services, posing a threat to the public safety of the general population,” Fujioka said in a statement. But when push came to shove, the county agreed it erred. “The Board acknowledges and accepts Californians Aware’s assertion and the District Attorney’s finding that (the relevant section of the Ralph M. Brown Act) was not an appropriate basis for discussing the implementation of AB 109 in closed session or for including the governor in the nonpublic discussions,” Fujioka’s statement said. Smyth’s bill, AB1736, is limited to the inclusion of the governor on the list of public officials allowed in closed-door meetings. Smyth’s bill does not address the question of whether it was OK for the supervisors to discuss AB109 behind closed doors in the first place – which, according to District Attorney Steve Cooley’s office, it wasn’t. According to the bill analysis, Cooley’s office noted that the realignment discussions were chiefly financial in nature and found that they “lack the urgency and magnitude of a threat to public access to services and facilities contemplated” by the Ralph M. Brown Act. Smyth’s bill cleared the Assembly on a 64-3 vote. It now goes to the Senate.